It appears that a vital force, known for thousands of years in China as chi, in Japan as ki and in India as prana, is the very essence of the universe and is in continuous interaction with matter. What is energy medicine and how is it different from Western medicine? Energy medicine proposes that the universe and everything in it is made up of energy. Even matter, as Albert Einstein’s formula (E=MC2) illustrates, is congealed energy. The term “subtle energy” was first used by Einstein to describe the minute, ongoing interrelationships between subatomic particles. It appears that a vital force, known for thousands of years in China as chi, in Japan as ki and in India as prana, is the very essence of the universe and is in continuous interaction with matter. In the past 100 years, the term “field” has appeared in scientific terminology to describe an invisible, nonmaterial emanation from an object. Increasing scientific evidence, especially from quantum physics, holds that all bodies, from atomic and subatomic particles to the earth itself, have their own fields, regardless of their size. Fields bring objects separated by space into relation with each other. Western medicine is based on the biochemical concept, meaning that all major life processes are chemical in nature. In Western medicine, the basic role of a gene — instructing its cell to produce a particular protein or other molecule — is well understood. Each cell undergoes some 100,000 chemical reactions per second, many of them regulated by the expression of the genes within its nucleus. What is not understood, however, is how these chemical reactions are coordinated with the actions of the body’s other 50 trillion cells. Genes seem to be informed about the actions occurring throughout the body and give their instructions as if they “knew” what the body needed from the other cells, in relationship to it all. However, Western medicine has failed to identify the chemical mechanisms that inform the gene about the state of the entire body. Scientists from various disciplines — including biologists, physicists and neurologists — have postulated that organizing fields direct biochemical processes as decisively as magnetic fields align metal filings. They believe that within these fields, biological information is transmitted to genes, neurons and other governing mechanisms. 1. Aura — the biofield. We are each an energy or vibrational matrix, of which the physical body is the most visible and dense. Our other fields lie outside our normal range of vision (from dense to finer vibration): the etheric (our physical double), emotional, mental and spiritual fields. These fields interpenetrate and interact with each other as we interact with our environment through our biofield. 2. Chakras — local fields concentrated in specific areas of the body. Whirling vortices of energy located on the midline of the body and the human spine, from the base of the tailbone to the area above the top of the head. They act like energy transfer stations, allowing the inflow of energy from the universe to enter the body and be dispersed throughout. They also permit release or outflow of excessive, unneeded energy. 3. Meridians — pathways that regulate energy flow within the body. They form the the human body’s electromagnetic circuitry, while hundreds of acupuncture points form the relay stations for these circuits. This threefold subtle energy system is continuously interactive within itself and with all other human informational systems, such as the blood circulation, lymph flows, chemical messengers and neural pathways. These interactions are vibrational in nature. 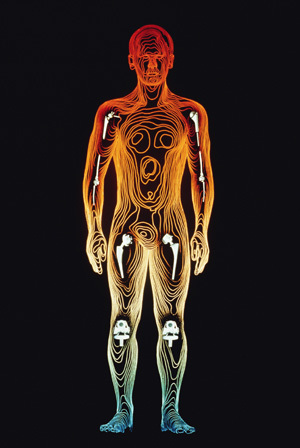 Vibratory patterns are evidenced in the human body and can be measured with current medical diagnostic tools, (x-rays, electrocardiogram, MRI, etc.). In fact, according to Richard Gerber, M.D., author of Vibrational Medicine, medicine is quickly becoming vibrationally focused, as scientific advances occur at an ever-increasing pace. Energy healers believe that the human body is a system of living energy, not just the sum of its parts. The recognition of the human being as a multidimensional field, with energy as its dynamic force, holds many implications for healing work. The mechanistic view of the body as a machine with replaceable parts gives way to the vision of each of us as a total human being who is at all times interconnected with the environment. In vibrational medicine, healers do not do the healing. They simply reinforce and supplement the individual’s own innate capability for self-healing. Impaired, blocked or diminished biofield, chakra or meridian functions have profound effects on biological, emotional, mental and spiritual health. Besides a healthy diet, stress reduction and other common-sense steps for building resilient energy patterns to counter illness and enhance health also are vitally important. Using energy medicine as a self-care system, an individual can be taught to assess their personal energy system and implement procedures, exercises and postures to correct imbalances. In energy medicine, we assess the energy field, looking for disruptions and imbalances in the body. Treatment is designed to correct such imbalances. Energy medicine, in fact, offers methods that instantaneously affect the entire body. The mechanism that allows energy interventions to have this holistic influence is the body’s connective tissue, which healers and some scientists believe is a communication medium, a liquid crystal electrical semiconductor that is “the Internet of our being.” Through the connective-tissue energy, interventions can simultaneously occur in every cell of the body. Since the body is electric and chemical, that is, an electro-biochemical mechanism, it just makes sense that healing is faster and more complete when we integrate the two systems. Malonie Gabriel, B.A., is a nationally certified massage therapist, lymph drainage therapist, Healing Touch practitioner and a Reiki Master at Rhythm of Life Integrative Medicine and Cancer Care. 480-668-1448 or www.rhythmoflife.com.